An article in Sunday’s Orlando Sentinel hints that two years after saying that the DIRECT project’s Jupiter 130 rocket “defied the laws of physics”, NASA engineers are putting the finishing touches on their nearly identical design: four space shuttle engines underneath the external fuel tank, two four segment solid rocket motors just like the shuttle stack, and the crew and cargo on top. The design made sense in 1992, 2004, 2008 and it still makes sense now. “It turns out Direct was right,” said one NASA engineer working on the project but not authorized to speak publicly. Many of the engineers working on the shuttle-derived rocket favor building a new rocket with new technology and propulsion systems but said that they recognize that Congress is unlikely to give them the money or the time they need to do that. Under the constraints NASA faces, the Direct-like approach is probably the best way forward, they said. Obama wants to dump Ares and turn much of the space program over to the competitive world of private enterprise. He sees the future in companies such as SpaceX, a start-up venture in California that is developing rockets at a fraction the previous cost. Nelson and the anti-government Republicans in Texas and Alabama want no part of this. They want big-government inefficiency and all the wasted billions that brings their states. They are joined by the aerospace giants, which see their guaranteed profits and $100,000 shuttle tool belts threatened. So here we sit. Ares won’t fly. Congress won’t give it up. Obama won’t fund it. NASA is devoid of a strong leader to break the logjam. And this takes us back to Direct’s Jupiter. The rocket that NASA once said was not physically capable of flight has now become a NASA option. “It turns out Direct was right,” a NASA engineer working on the project told the Orlando Sentinel this week. Now they tell us? This means that NASA either is completely incompetent, has been lying for four years or is praying its last Hail Mary. Adds $6 billion to NASA’s budget over five years and draws upon American ingenuity to enable us to embark on an ambitious 21st Century program of human space exploration. Initiates flagship exploration technology development and demonstration programs of “gamechanging” technologies that will increase the reach and reduce the costs of future human space exploration as well as other NASA, government, and commercial space activities. Embraces the commercial space industry and the thousands of new jobs that it can create by contracting with American companies to provide astronaut transportation to the Space Station—thus reducing the risk of relying exclusively on foreign crew transport capabilities. Ends NASA’s Constellation program, which was planning to use an approach similar to the Apollo program to return astronauts back to the Moon 50 years after that program’s triumphs. 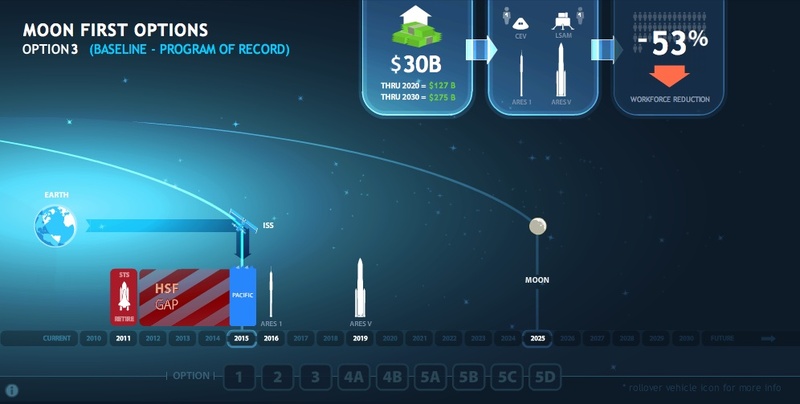 An independent panel found that Constellation was years behind schedule and would require large budget increases to land even a handful of astronauts back on the Moon before 2030. Instead, we are launching a bold new effort that invests in American ingenuity for developing more capable and innovative technologies for future space exploration. Extends the International Space Station and enhances its utilization, bringing nations together in a common pursuit of knowledge and excellence in space. Enhances the Nation’s global climate change research and monitoring system, including reflight of a satellite that will help identify global carbon sources and sinks. Provides for a robust program of robotic solar system exploration and new astronomical observatories, including a probe that will fly through the Sun’s atmosphere and an expanded effort to detect potentially hazardous asteroids. Revitalizes and realigns NASA to put in place the right workforce and facilities to function as an efficient 21st Century research and development agency. 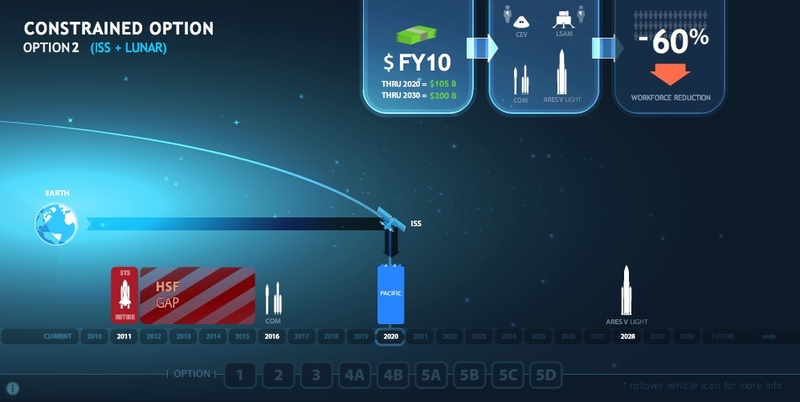 Research and development to support future heavy-lift rocket systems that will increase the capability of future exploration architectures with significantly lower operations costs than current systems—potentially taking us farther and faster into space. The Administration proposes to cancel the Constellation Systems program intended to return astronauts to the Moon by 2020 and replaces it with a bold new approach that embraces the commercial space industry, forges international partnerships, and develops the game-changing technologies needed to set the stage for a revitalized human space flight program and embark on a 21st Century program of space exploration. Now the question is how this actually translates into programs. Does the HLV quote mean a Shuttle Derived Launch Vehicle ready to give American astronauts access to the ISS by 2014/2015? Or, does the “set the stage for a revitalized human space flight program” quote mean that Human Space Flight by America has been kicked down the road for a decade while Research and Development figure out if we can do it? NASA Administrator Charles Bolden and Chief Financial Officer Beth Robinson will brief reporters about the agency’s fiscal year 2011 budget during a teleconference at 10:30 PM Phoenix (12:30 PM EST), which will carried in audio only at http://www.nasa.gov/news/media/newsaudio/index.html. If it is as carefully scripted as the Budget, we may know little more than what is apparent so far. We will see if there are questions from reporters, and if so, whether any of the questions are meaningful. Bolden has begun speaking. His first significant note is that over the next five (5) years the NASA budget will be increased by $6 Billion. The ISS will continue to 2020 and beyond in cooperation with our International Partners. Collaboration with our partners to build the technology for missions to Mars that takes weeks, rather than months. Commitment to green aeronautical research. The Constellation program would not get us back to the Moon. So this budget cancels Ares I, Ares V and Orion. We were neglecting investments in key tech to get beyond moon. The Augustine Commission has given us significant goals which this administration seeks to achieve. We will be discussing these awards in more detail, and introducing you to the space pioneers behind them tomorrow at our event at the National Press Club. We intend to make full use of the International Space Station. There is so much to know before we move out of Low Earth Orbit. NASA will fly out the remaining five flights of the Shuttle. 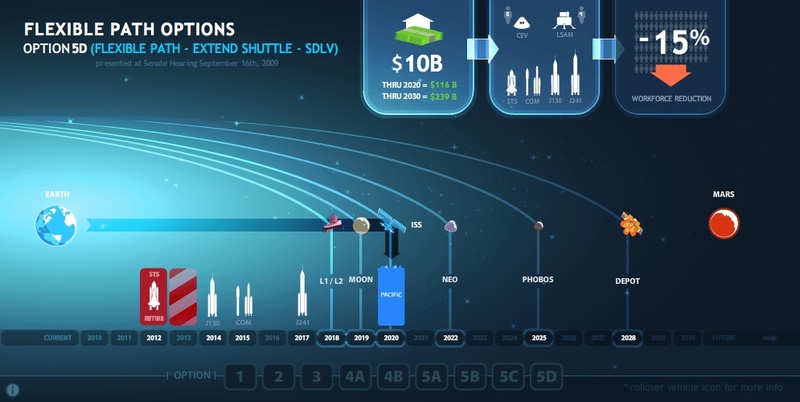 NASA will have funds for 2011 if the shuttle schedule slips. Lori Garver is now speaking. Heavy Lift Vehicle R&D budget is very robust. It is not for a restacking of existing technologies. 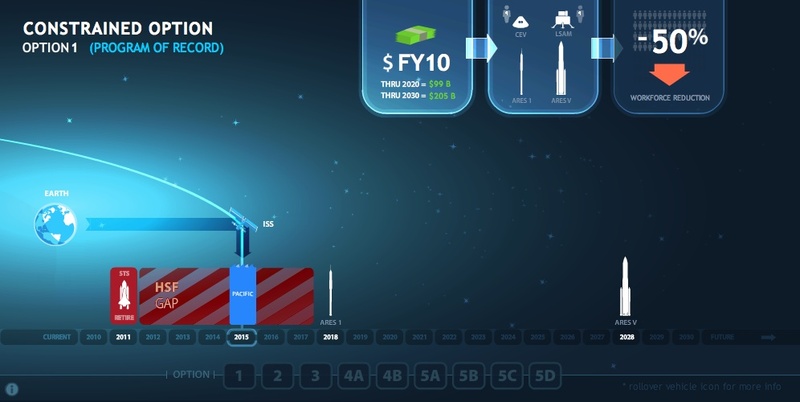 Constellation provided no real development funding for HLV until 2016, only research until that time. Now, beyond LEO with HLV on a timetable faster than Ares V.
Looking at flagship missions, that they are going to design over the next couple of months. Don’t want to relive the mistakes of the past. Commercial competition will see industry define the vehicles and time lines for crew and cargo. They will tell us what they can provide. Expects bids on previous investments. Orion may come back as part of a commercial bid. Propellant Depots are in the mix. [Ed] Reading between the lines, it may well be that Boeing / ULA or others will bid a Shuttle Derived Heavy Lift Vehicle using existing Shuttle Assets. In any case, the budget goes to Congress, and there will be much blood on the sand before this is over.[/Ed]. Monday we will know for sure. It was crazy in 2006. Is it crazy now? DIRECT advocates the resurrection of the National Launch System (NLS). 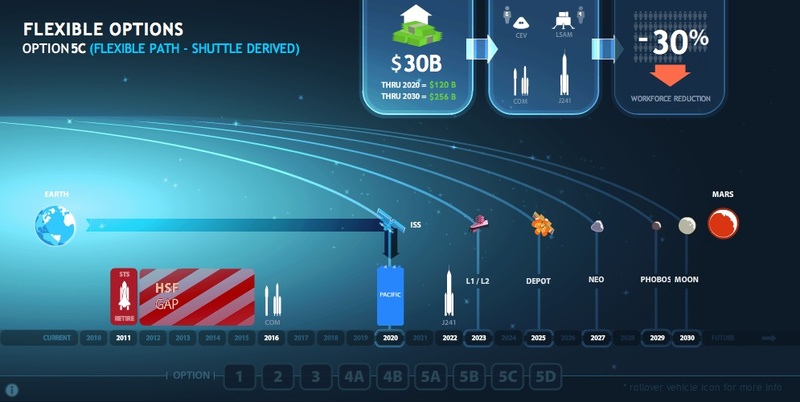 You can play their animation showing the transition from Shuttle Parts to Jupiter Parts. The NLS proposed to use the shuttle External Tank (ET), the Space Shuttle Main Engines (SSME) and the two Solid Rocket Boosters (SRB) as a cargo rocket with three times the capacity of the Shuttle itself, but was abandoned by Congress because the cost to operate two rocket systems was too high. Following the loss of Columbia, and the determination that the aging Shuttle fleet should be retired, NASA set about planning for the future. NASA engineers resurrected the NLS concept of reusing the existing Shuttle components, but were overruled by then Administrator Griffin. Instead, NASA was set on a course to develop two brand new rockets: Ares I and Ares V.
Now, Popular Mechanics may well have scooped the “regurgitation media”, the ghosts of investigative journalism of long past years, who now only copy each others rumors about bad news, hoping to sell advertising. On Friday, 29 January 2010, Popular Mechanics published “Rebel Engineers Sit With NASA to Chart Future of Manned Space“. Moonlighting engineers get their say at a secret NASA meeting—and dish hints of what NASA’s future rockets might look like after the massive shake-up of manned spaceflight programs. That is a lot of firepower to be meeting with a group of people dismissed by the “regurgitation media” as “PowerPoint Rocketeers”. Further, Popular Mechanics confirms much about what has been written recently about the coming changes here and here at NSS Phoenix. Finally, Chris Bergin just published “MAF provide positive ET hardware overview for early SD HLV test flight” at NASAspaceflight.com. NASA press release concerning Monday’s press conference by Gen. Charles Bolden at 1:00 PM Phoenix time (3:00 PM EST) and the budget (which will be available at 10:30 AM Phoenix (12:30 PM EST). It seems pretty clear that sometime in February (watch for the release of the 2011 Budget), the Obama Administration will task NASA with the Flexible Path architecture (see Flexible Path 5D from The Augustine Commission Wrapped Up post). This is likely to involve taking aim at Phobos in a series of increasingly difficult tasks. In the past several days, it has become increasing clear that a political compromise is being crafted concerning NASA’s rocket program. It has become obvious that NASA’s budget is not likely to increase very much, and therefore, the development of two brand new rockets is impossible (The Ares I, underpowered and over budget, and Ares V, a paper rocket that is so large we would need to rebuild half the Kennedy Space Center infrastructure). On the other hand, a true Shuttle Derived Launch Vehicle (SDLV) using the Space Shuttle Main Engines (SSME), The External Tank (ET), and the ATK Solid Rocket Boosters (SRB) would be affordable (40% of a rocket development is engine design, and we skip that step), and ready to launch large payloads to re-supply the aging International; Space Station (ISS) by 2014. 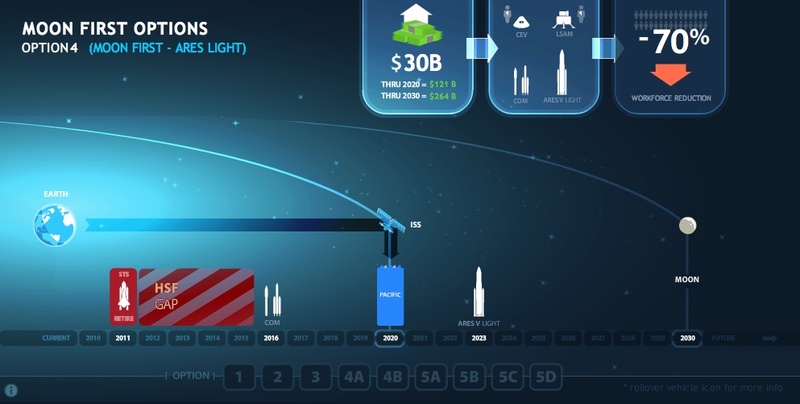 If one looks at throw weight from the Summary Report of the Augustine Commission: the Ares I + Ares V can put 185 mt into Low Earth Orbit (LEO) while two (2) SDLV vehicles can put 200 – 220mt into LEO. Its no contest. All this is from the technical point of view. To craft a solution, one must factor in the politics of the pork. A lot of jobs are at stake. And apparently Senator Shelby has joined the compromise (see Ross Tierney’s comments). Further, Alliance Technology (ATK), which has a contract to develop a five (5) segment version of the Shuttle SRB for the Ares I rocket, is willing to settle for the 5 segment over the 4 segment SRB, and has joined the compromise. So what does the most likely SDLV look like? As discussed here, and reviewed at NSS Phoenix, the rocket will use four (4) SSMEs, a stretched External Tank to increase the fuel load to accommodate the four engines, and two (2) five segment SRBs. And where can we go from here? A video of Manned NEO Mission concept from the Constellation program gives some idea of what to expect (ignore the launch vehicles). And what are the missions along the “Flexible Path”? A preliminary list is given below from one of the threads on the Forum at NASASpaceFlight.com. You can disagree over the timetable, you can quibble about the missions, you can wince at Bernie Roehl’s hyperbole, but it is an exciting list of missions that increasingly build infrastructure for the exploration of the Solar System. In the Fall of 2009, Bolden tasked NASA with evaluating Heavy Lift Vehicles. These included the Ares V, the Sidemount shuttle derived vehicle, inline shuttle derived vehicles similar to DIRECT Jupiter and what appeared to be a Saturn V type vehicle capable of lifting 200 mt to Low Earth Orbit, which surfaced briefly in a NASA white paper on “Flexible Path“. Reports indicate that Bolden will review this internal report today, Friday, 15 January. The chief contender is a configuration consisting of four (4) Space Shuttle Main Engines (SSME), a stretched 8.4 meter shuttle External Tank (ET) and two (2) Solid Rocket Boosters (SRB) from the Shuttle Program. These SRBs are likely to include a dummy fifth segment (similar to the Ares I-X test rocket), and then migrate to a full five (5) segment SRB. The core configuration is very similar to the Jupiter 140 Stretched Heavy (See Jupiter 140 image to the left). The upper stage is reported to include between four and six RL10A-4-3 engines, a variant of the RL10B-2 currently flying on the Centaur upper stage of the Delta IV rockets. These very reliable upper stage engines date back to the Saturn V upper stages in the Apollo era. A clue to the direction likely to be taken comes from yesterday’s meeting of the Program Requirements Control Board (PRCB). A proposal was put forward to delay the disposal of SSME assets, pending “future launch vehicle architecture” decisions. This includes certain operations at the Stennis Space Center and delays in disposing of new production capabilities for space shuttle main engines. The recommendation was to delay a decision until June 2010, in order to protect future shuttle derived launch vehicle architecture. The possible restart of SSME production was given as one to two years. Of note is the fact that no mention of the Space Shuttle Program beyond current plans was mentioned in the PRCB deliberations. Observers note that Charles Bolden is not one to rush to judgment. His response to the NASA report is not likely to be known for a while. SpacePolitics.com reports on the symposium “Human Spaceflight and the Future of Space Science”, sponsored by the Universities Space Research Association (USRA) and The Space Policy Institute at George Washington University (GWU). Senator Jeff Bingham (D-New Mexico) of the Senate Commerce Committee held up a working draft of a proposed bill titled the “Human Spaceflight Capability Assurance and Enhancement Act”. Irrespective of the lack of PRCB language about additional shuttle flights, discussed above concerning shuttle engine preservation, it seems there is growing support for a shuttle extension. It makes sense that if you are going to extend shuttle parts production (engines, tanks and SRBs), then shuttle extension is a logical step. But you need more money to do that. Which seems quite likely, as a number of senators have a lot of jobs wrapped up with the existing shuttle infrastructure. Follow the Money. Following on the Tuesday meeting at NASA headquarters concerning revamping the governance structure, and Wednesday’s meeting between NASA administrator Charles Bolden and President Barack Obama, the rumor mill has been if full fury. Recommend Commercial development of Low Earth Orbit (LEO) launch capability for cargo and then crew. 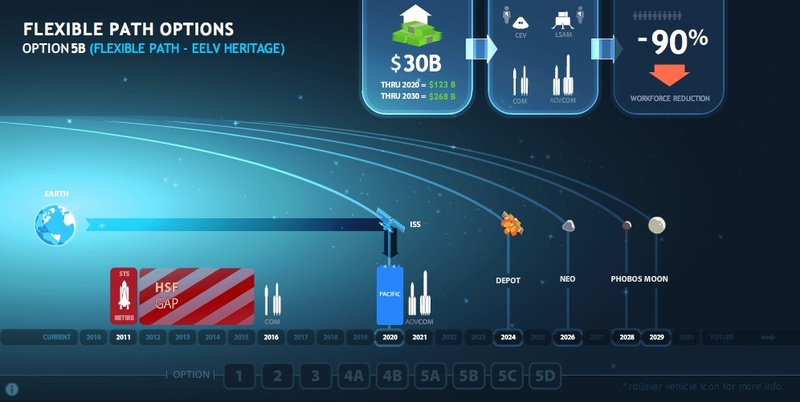 Development of a smaller heavy lift rocket along the lines proposed by the old NLS (National Launch System) NASA investigated in the early 1990’s and revived by the Direct Team between 2005 and today. European countries, Japan, and Canada would be asked to work on a lunar lander and modules for a moon base. Additional probes to the Moon, Mars and and the moons of Mars. Immediate blow back is expected from Senator Richard Shelby, who has asked the Inspector General at NASA to investigate “corruption” within the Augustine Commission. Shelby stated that several Augustine panel members were registered lobbyists who took “direct advantage of their temporary roles on the Commission to further their personal business.” This has been interpreted as a shot across the bow in the fight over Ares I and the jobs it creates at the Marshall Space Flight Center in Shelby’s state of Alabama. Whose bow it was aimed at is in question, and it looks like an act of desperation. However, as noted in our Wrap Up report on the Augustine Commission, time is of the essence with regard to jobs and the retention of skills associated with building the 8.4 meter External Tank used by the space shuttle and the proposed heavy launch vehicle derived from the shuttle. If the politicians resist the change that’s coming to NASA, they may lose everything. Denials to the Science Insider article came immediately from NASA and the White House. NASA spokesman Morrie Goodman said the article was “speculation.” White House spokesman Nicholas Shapiro echoed that characterization.